Elbow-securing strap gives extra support. Supports the hand, arm and shoulder. Straps are adjusted easily with metal buckles. 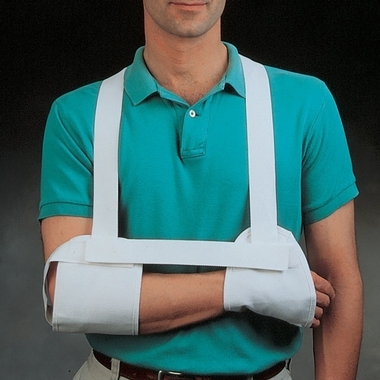 Adjustable strap between forearm cuffs is secured with hook and loop fasteners. Once fitted, the Standard Hemi Arm Sling can be donned and doffed without assistance. Wrist cuff measures 9-1/2" x 5-1/2" (24 x 14cm). Elbow cuff measures 10" x 5" (25 x 13cm).